For two decades, Dr. Peter Fuda has been a Sherpa to leaders, teams and organizations across the globe as a consultant, coach, author, researcher, speaker and professor of management. Peter and his team at The Alignment Partnership (TAP) have created some 50 cases of business transformation, and more than 1,000 individual cases of leadership transformation around the world. Clients include MasterCard, Kraft, Microsoft, Dow Jones & Co, Philips, Bayer, Mars, Luxottica, Foxtel, Macquarie Group, MSD, Westpac, Lenscrafters, Telstra, Suncorp, Rabobank, Scentre Group, and the government of Hong Kong, among many others. In an environment where 70% of all change efforts fail, TAP has a better than 90% success rate. 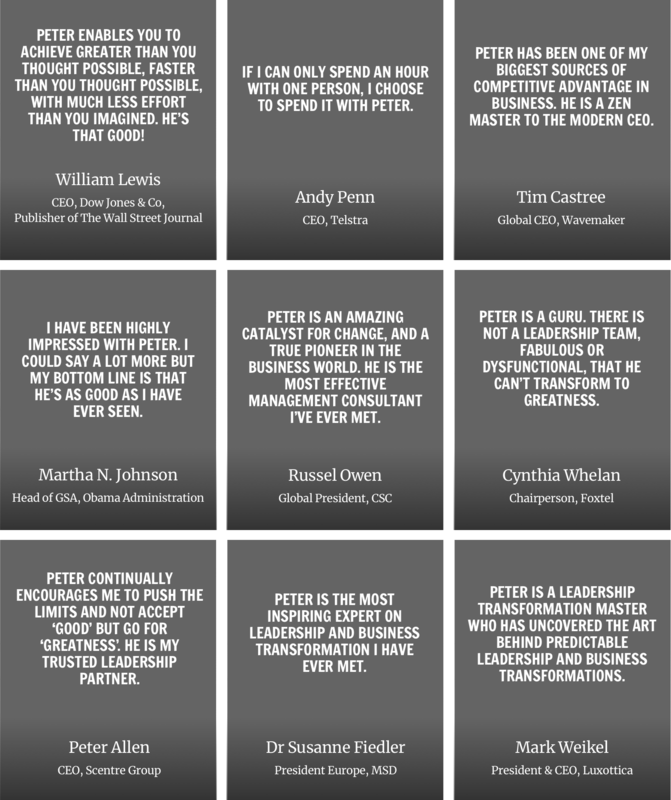 Peter has coached more than 200 CEOs to measurably increase their leadership effectiveness and performance. Peter is the first Australian published on transformation in the Harvard Business Review. He is the Executive Producer of the documentary film Beyond the Superhero, licensed to Qantas. He is the author of the international bestselling book Leadership Transformed; How Ordinary Managers Become Extraordinary Leaders, and has taught his original content in the MBA program at Macquarie Business School for several years. He has completed countless speaking engagements to hundreds of thousands of people on four continents, is a regular commentator across print, TV and radio media, and his doctoral research is now required reading at universities around the world. Most recently, Peter has been driven by a mission to democratize the science of transformation, via a world first digital system for leaders, team and entire organizations. It’s called Enixa. Peter holds a Doctorate in Business Administration, a Master’s degree in Commerce, and a Bachelor of Arts with first-class honours.